During the milling process, and especially during corner engagement, tools undergo significant variations in cutting forces. One common and difficult situation is when a cutting tool experiences an “inside corner” condition. This is where the tool’s engagement angle significantly increases, potentially resulting in poor performance. 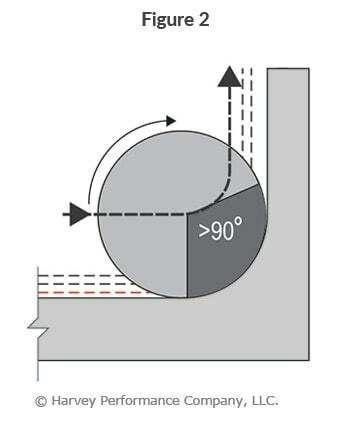 Generating an inside part radius that matches the radius of the tool at a 90° direction range is not a desirable approach to machining a corner. In this approach, the tool experiences extra material to cut (dark gray), an increased engagement angle, and a direction change. As a result, issues including chatter, tool deflection/ breakage, and poor surface finish may occur. Generating an inside part radius that matches the radius of the tool with a sweeping direction change is a more desirable approach. The smaller radial depths of cut (RDOC) in this example help to manage the angle of engagement, but at the final pass, the tool will still experience a very high engagement angle. Common results of this approach will be chatter, tool deflection/breakage and poor surface finish. 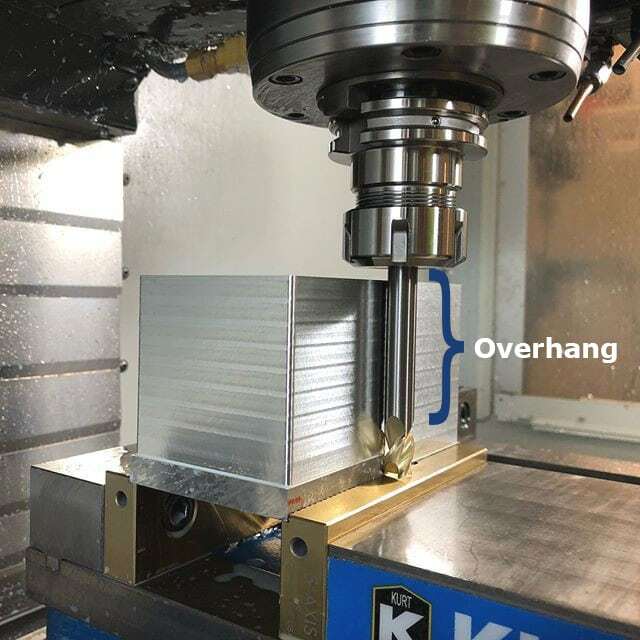 Generating an inside part radius with a smaller tool and a sweeping action creates a much more desirable machining approach. The manageable RDOC and smaller tool diameter allow for management of the tool engagement angle, higher feed rates and better surface finishes. As the cutter reaches full radial depth, its engagement angle will increase, but the feed reduction should be much less than in the previous approaches. Feed rate may need to be heightened depending on the “tool-to-part ratio.” Utilize tools that are smaller than the corner you are machining. Poor tool life and premature tool failure are concerns in every machining application. Something as simple as tool path selection – and how a tool first enters a part – can make all the difference. Tool entry has a great deal of influence on its overall success, as it’s one of the most punishing operations for a cutter. 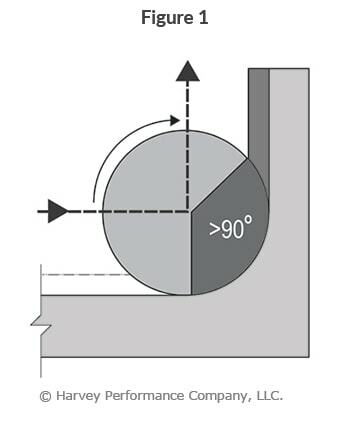 Ramping into a part, via a circular or linear toolpath, is one of the most popular and oftentimes the most successful methods (Figure 1). Below, learn what ramping is, its benefits, and in which situations it can be used. Ramping refers to simultaneous radial and axial motion of a cutting tool, making an angular tool path. Oftentimes, this method is used to approach a part when there is a need to create closed forms such as pockets, cavities, engravings, and holes. 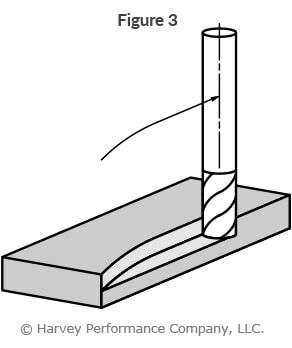 In doing so, the need to plunge with an end mill or drill to create a starting point is eliminated. 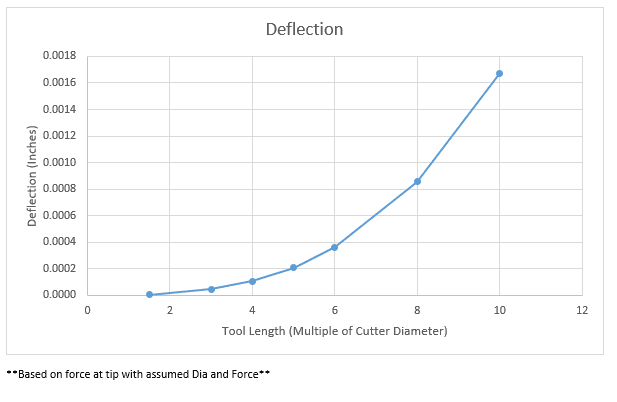 Ramping is particularly important in micromachining where even the slightest imbalance in cutting forces can cause tool failure. 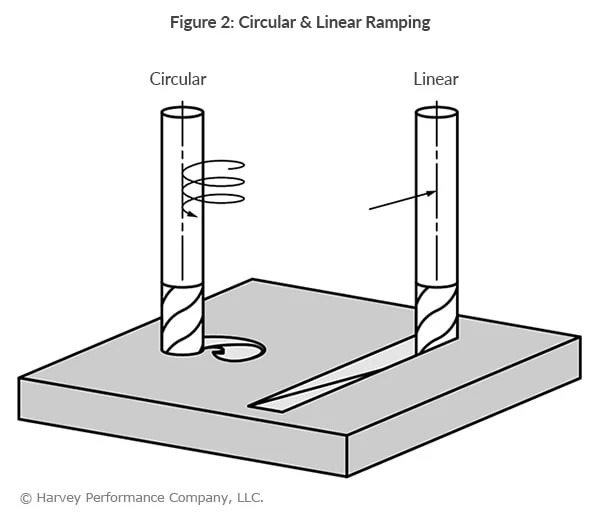 There are two types of ramping toolpaths: Linear and Circular (Figure 2 ). Linear Ramping involves moving a cutting tool along two axes (the z-axis and one of the x, y axes). This method has significant more radial engagement with complementary increased cutting forces distributed across only two axes. Circular Ramping (Helical Interpolation) has a spiral motion of the cutting tool that engages all three axes (x, y, and z axes). 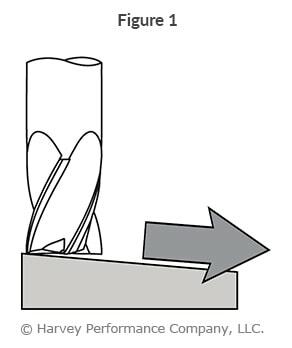 This method typically has less radial engagement on the cutting tool, with the cutting forces distributed across the three different axes. This is the recommended method, as it ensures the longest tool life. 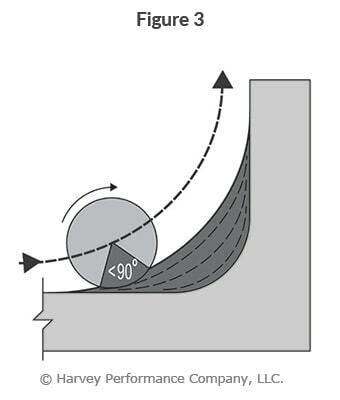 When a tool enters the part via a Ramping method, it gradually increases in depth, preventing any shock loading on end mills. 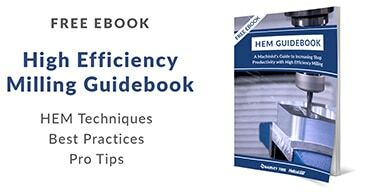 This reduces costs resulting from unnecessary tool breakage. 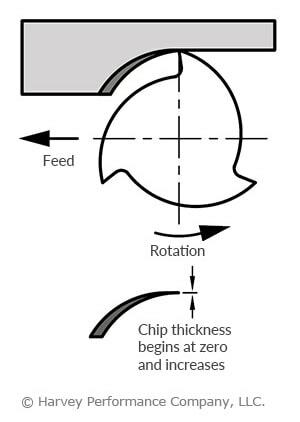 Ramping produces smaller chips when compared to plunging, which makes chip evacuation faster and easier. 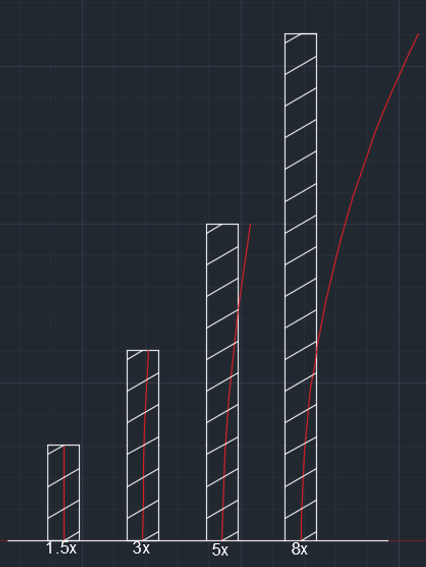 As a result, cycle time can be decreased by running the end mill at faster parameters. Ramping also creates an extra space in the tool changer that would otherwise be occupied by a drill purposed with machining a starter hole. Similar to ramping in both method and benefit, arcing is another technique of approaching a workpiece (See Figure 3). While ramping enters the part from the top, arcing enters from the side. 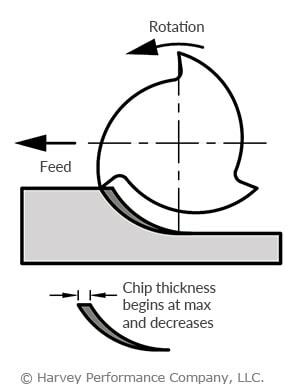 The end mill follows a curved tool path (or arc) when milling, thus gradually increasing the load on the tool as the tool enters the part, as well as gradually decreasing the load as the tool exits the part. In this way, shock loading and possible tool breakage are avoided.